There's a whole lot more to Facebook than poking people, sharing your status and commenting on photos. Applications make Facebook into a wider social site where you can play games, enjoy common interests, and share gifts. Most applications are provided by third parties who have developed them according to Facebook's guidelines. As with applications that you run on your computer, you need to ensure that they're trustworthy before giving them access to your information. You can find new apps to install in the Application Directory. You'll find Facebook recommendations, plus information on which of your friends use each application. Use the search bar to look for apps by name, or browse through the categories in the left-hand column. You may also receive invitations from friends to start using particular applications, but check them out before accepting by visiting the app's profile page. Applications have profile pages similar to your own, which give information about the application and show other users' reviews. Select the app from the Directory to see its profile, and go to the Info tab to read the information provided by the developer. If you also want to find out what other users think about this application, click the Reviews tab. If you're happy with what you see, return to the application's wall and click "Go to Application". Click Allow, to permit the application to access your data, and it will now appear in your list of applications on your profile. Select the application to go to it. You can add as many apps as you like, although not all will appear on your profile page. If you want to ensure an application appears in the left-hand column simply bookmark it – in the top right-hand corner of the page, click Account > Application Settings. Pick the app to bookmark in the list and choose Edit Settings. Click the bookmark tab and select bookmark. If you subsequently decide you don't want to continue using an application, you can remove it. Go to the Account drop-down menu in the top-right of the page and choose Application Settings. Find the application that you want to remove and click the X to its right, then click OK to confirm it. You can also make a dedicated tab for a particular application if you like it, by clicking the + icon to the right of your existing tabs on your profile. Select the application you want to add from the list, or search for more options. Lexulous is a fun word game that follows very similar rules to Scrabble. You can play against friends or challenge random strangers to beat your word power. You're given seven random letters and you need to create words that fit into the growing grid. Click and drag the letters from your hand onto the board, and you'll score more for double and triple letter or word scores. It's currently one of the best-loved applications on Facebook and can be a huge time-sink because it's so addictive. Given Facebook's aptitude for sharing photos with friends, it makes sense to also have a photo-editing tool available on hand for quick image fixes. Picnik provides you with access to its online photo-editing directly within Facebook. You can crop, rotate, resize and colour-balance your photos, or remove red-eye. It's ideal to use on pictures that you've emailed in or sent from a mobile, where you wouldn't normally have editing features. Picnik also enables you to browse and edit any photo you're tagged in. Flixster is designed for movie-lovers to discuss films they've seen with Facebook friends and fellow cinema-goers. The application helps you keep up with the latest releases in cinemas and on DVD, and you can rate the movies you've already seen. Plus you can flag films you want to see, so you can arrange to watch them with other friends using the application. Flixster also includes thousands of movie trivia quizzes that you can complete, and challenge friends to beat your score. Share your travel experiences with your friends and help them decide where to go and what to do when they venture out in the world with TripAdvisor. There's an element of travel-boasting involved, where you mark which cities on a map of the world that you've visited, but you can also note those that you know well enough to advise others on. More importantly, you can fl ag places that you'd like to visit, and benefit from the wisdom and experience of your other friends who've already been there. Similar to Trip Advisor's application, Where I've Been extends beyond the list of your frequently visited cities and enables you to note down everywhere you've been in the world. You can post reviews of places for the benefit of the whole community, or become an expert on a particular place if you'd like to advise others. Where I've Been comes well-tipped by members of the travel industry, and so it goes beyond simply flaunting your travel experience to become a research tool in itself. Link your Twitter account to your Facebook profile and get two social networks for the price of one. You can use the Twitter app to find and follow those of your Facebook friends that also use Twitter. You can also set the application to automatically post your tweets to update your Facebook status. It will ignore @replies and direct messages, however, to prevent your status getting clogged up with Twitter conversations. Use the application to encourage Facebook friends to find and follow you on Twitter. PuzzleBee suits jigsaw lovers everywhere. Use it to create new jigsaws from your own Facebook photos, or compete against other users to finish the "jigsaw of the day" puzzle in the shortest time. Unlike other online puzzles, you can rotate pieces as well as move them around, and you can change the number of pieces in each puzzle to alter the level of difficulty. As you complete different puzzles you move up the hierarchy, in a quest to progress from Baby Bee to Queen PuzzleBee. The DivShare application links your Facebook account to its online storage service, so you can use it to share documents, photos, music and videos with your friends. It enables you to link your files with your profile, or post them on friends' walls. You can even share them in your news feed. Files can be up to 200MB in size and you can have unlimited storage space on the DivShare servers. You can host anything that meets the terms of service for free, as long as your account lasts, and you don't have to register. 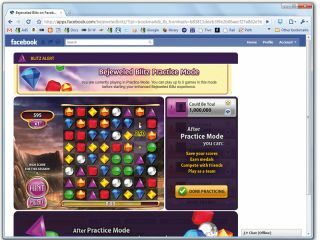 Web Sudoku provides you with a new Sudoku puzzle to play within Facebook every day. Enter numbers one to nine in the blank squares, without repeating any in a row, column or block. The puzzles come from Web Sudoku, which is the most popular Sudoku site on the internet. You can change the level of difficulty as you improve – puzzles come in easy, medium, hard or evil levels. When you complete a puzzle you can compare your time with your friends, or see how you rank against all Web Sudoku players. Why sell your second-hand items to strangers using eBay? Instead you can advertise them to people who you know and trust within your group of Facebook friends, using Market Place. You can use it to advertise stuff you want to give away for free, or set up a classified-style listing for items that are worth money. You can also use it to find articles for sale within a specified distance of your location, and sift through listings to find tickets to events, housing, cars and even jobs advertised.